Here are two very similar views of the Promenade and Gardens, both of which feature a wooden platform or dais and a gazebo that have been erected around the Promenade's lamp. They provide us with a view of North Parade in the late Victorian and early Edwardian era as both pictures must have been taken in the very early years of the twentieth century at the latest. 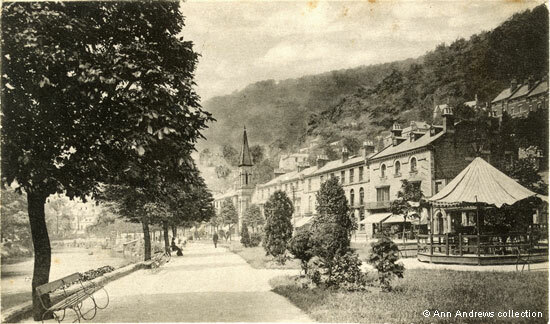 The lamp can be seen in other photographs of the Promenade; it was eventually removed and Matlock Bath's War Memorial was erected on the same spot. In 1890 a plan to install forty [gas] candle power lamps along both North and South Parade, extending from Mr. Bryan's shop at the bottom of Holme Road as far as the fish pond, was supported by the Local Board. The existing posts were to be used, and the plan included a lamp that was to be erected the centre of the east end of the Promenade although this was not approved at that time. Street lamps powered by electricity were a thing of the future and something Matlock Bath's Board members resisted. There was a complaint in 1900 as Matlock Bath [Council] hadn't lit a portion of the Promenade and Lovers' Walks. The initial outlay would have cost £30 and some thought Matlock Bath could afford these luxuries as gas was so cheap. 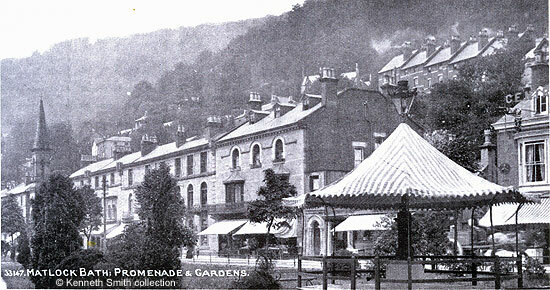 By 1905 the Promenade was illuminated after nightfall and a mid week fund raising bazaar was held in a marquee on the Promenade by the Matlock Bath Band Committee. Three daily band concerts were being held on the kiosk on the opposite bank of the river throughout the summer season and on this occasion there was a musical programme provided during both the afternoon and evening. The top postcard looks down the length of the Promenade, with garden benches placed at intervals along its length. The gardens are slowly maturing. Whilst the trees had already been planted along the roadside, the hedge of later years was not yet in place and there was a low fence between the gardens and the main road. There are chairs on the wooden dais beneath the gazebo. It is difficult to see but the top card has the number 17204 down the first tall building from the right (just above the lower left edge of the canopy). If this is the publisher's number, which is likely, then the photograph dates from about 1898. The image below shows us more of the Parade, from the Central Restaurant on the far right to the Derwent Parade Methodist Church on the left. Look behind the gazebo and to the right hand side in front of the restaurant. A horse and some kind of laden cart, possibly a wagonette, is trotting along the road towards Matlock. There were no chairs on the dais in this picture. There is a similar card but of a later date (posted in 1909), in the "Just Images" section on this site. If you look at the railings you will see they are higher than those shown on this image. 1. "The Gardens, Matlock Bath", Valentine's Series. Posted 14 May 1904 in Matlock Bath to Miss Marie Bride of Kent Went over to Chatsworth but unfortunately the hall is closed all week... Came on here this afternoon. 2. "Matlock Bath. Promenade and Gardens", No. 33147, in the collection of and provided by and © Ken Smith. Postcard registered by Valentine in 1900. Images scanned for this website and information researched by and © Ann Andrews. "Derbyshire Times and Chesterfield Herald", 23 August 1890. Report of Local Board meeting. "Derby Daily Telegraph, 1 September 1905. Promenade concerts.